Combining music and mechanical choreography to spectacular effect, Ecstatic Arc is seductive in its raw beauty. 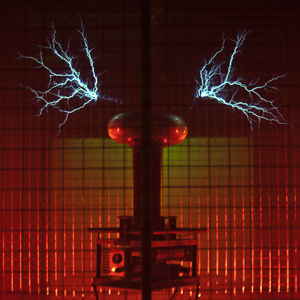 The theatrical installation is based on a dystopian future of masks and sculptures, created using found objects, recording devices and a caged Tesla coil. Ecstatic Arc was commissioned by Cryptic for Sonica 2012 and sold out – this is another chance to see this spectacular installation of sound and electricity.